Description: Signed in pencil Carl Beam '92, 14 3/4" x 10 1/2" mixed media on paper, comes framed behind wood and glass 23" x 19". 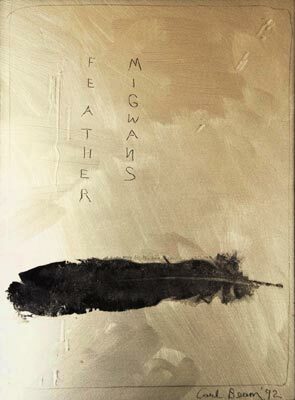 Migwams was his native name. Provenance: Lake Galleries, Toronto. Beam was made a member of the prestigous Royal Academy of Artists in Canada (RCA) in 2000. He passed away in July, 2005.